A volcanic eruption in 1961 led to the evacuation of the population to England, where they tasted modern life. However, the community chose to return to Tristan in 1963. Active volcanic islands can seem very benign as the time-scale between eruptions can span centuries. To a modern geologist, the tell-tale signs were there for all to see on the island of Tristan da Cunha . A classic pyramidal shape with a symmetric summit crater, a recent lava flow at Stony Hill not yet covered by vegetation, and everywhere evidence of hundreds of previous dark grey lava flows sandwiched between layers of fragile ash, often looking like Aero chocolate. But there had been no recorded volcanic activity during human history. The eruption started as magma pushed upwards and caused earthquakes which produced landslides directly behind the settlement during August and September 1961. On 8 th October a large earthquake and landslide particularly affected the eastern settlement where families moved overnight to the homes of relatives in the quieter western district. The following morning saw a fissure open between the Settlement and the canning factory where the ground rose. At a hastily organised meeting in the Hall, convened by Administrator Peter Wheeler, it was agreed to evacuate all the 264 islanders and 26 expatriates to huts at the Potato Patches overnight. 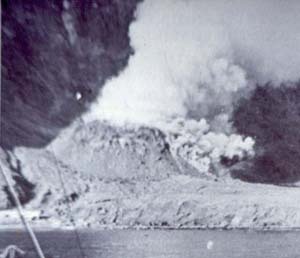 By 10 th October the rising ground had become a new volcanic cone and threatened the Settlement nearby, so a decision was taken to evacuate the island. Luck was on the community’s side as ships were immediately available for the three stage relay journey which projected the world’s most isolated community from their quiet home village into the glare of world publicity. 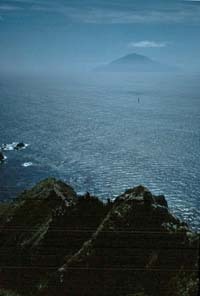 The fishing boats Tristania and Frances Repetto were on hand (rarely are two boats available locally in 2005) to take the islanders out of immediate danger to Nightingale Island to shelter overnight. The following day, 11 th October, the Dutch ship Tjisadane,( equipped to carry 400 but only carrying 20 passengers and due to pick up two Tristan girls to embark on nurse training) picked up the marooned islanders for the leg to Cape Town, arriving on 16 th October for a hectic few days , and then aboard the RMS Sterling Castle to arrive in Southampton on 3 rd November. The eruption pictured in October 1961 before lava flows destroyed the canning factory (left) and Big Beach. The UK Government assumed that the evacuation was permanent. There had been several well documented crises in the Tristan community’s history when it was considered by officials that the island community should be abandoned, due to accident, environmental and economic circumstances. Surely a volcanic eruption, with a lava flow destroying the island’s factory and both good landing beaches, with wild dogs savaging livestock and unknown visitors ransacking empty houses, would mean the island would be uninhabitable, even for the tough Tristan islanders. Especially as the repatriated community could be assured of a warm welcome, be found jobs and enable children to have a good education and make their way in the 'mother country'. The Islanders had other ideas as they struggled to come to terms with their enforced move, first to Pendell Camp in Surrey, and then to the former RAF Calshot Camp on Southampton Water in 50 houses on a road which is still called Tristan Close. Many thrived, children attending local schools and adults employed in a variety of local businesses and ships. But problems occurred: a pensioner was mugged and the islanders lacked immunity from ‘flu epidemics and also had to endure the appalling 1962/3 winter. A Royal Society expedition in early 1962 studied the new volcanic cone and its impact. After a positive feedback, the islanders lobbied to return and a Resettlement Survey Party including 12 islanders left on 9 th August and arrived back on Tristan on 8 th September to begin the formidable task of making the Settlement habitable and paving the way for a possible return after a year of neglect. Still expecting them to stay, the British Colonial Office arranged a hasty ballot in December but the community voted 148 to 5 in favour of returning. An advance party of 51 left Tilbury on 17 th March on RMS Amazon, transferring in Rio de Janeiro to the MV Boissevain and arriving on Tristan on 9 th April. The main re-settlement group of 198 islanders left Southampton aboard the Danish ferry Bornholm on 24 th October and on 10 th November 1963, the miracle was complete, most of the world’s most isolated community had returned to their volcano-ravaged Settlement - rejecting the booming consumer society of England’s swinging sixties.